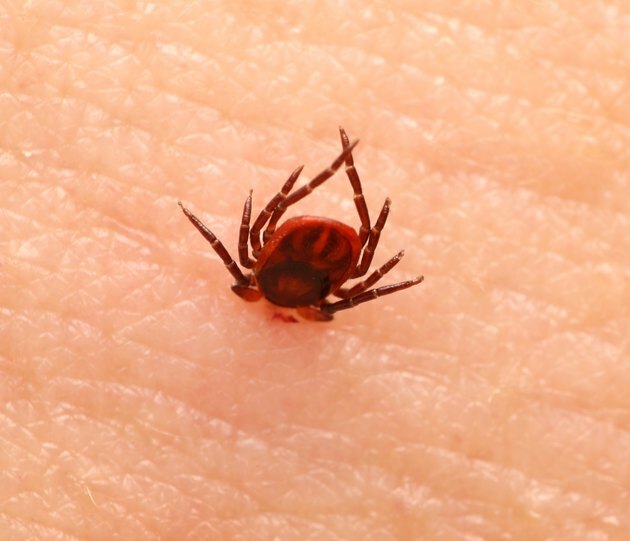 While chemical-based tick repellents, such as those containing DEET, picaradin and permethrin, are approved for use in the United States, concern over the potential side effects of these synthetic products has motivated some parents to seek a natural alternative to protect their children from tick bites. One such repellent is lemon eucalyptus oil. Several commercial products with this naturally occurring oil are now available and are, with some restrictions, useful for defending kids against ticks. Categorized as a biopesticide repellent by the Environmental Protection Agency, lemon eucalyptus oil was first registered with the federal government in 1948 as an insecticide and miticide. Lemon eucalyptus oil is now found in sprays, lotions and other preparations as a broad spectrum insect repellent for both children and adults. Products with lemon eucalyptus oil usually contain between 10 and 40 percent of the active ingredient, p-Mentane-3,8-diol, or PMD, a naturally-occurring chemical within the oil. Discovered in the waste distillate of oil extract, PMD is also produced synthetically and is often used instead of the natural oil. According to the Tick Management Handbook from the Connecticut Agricultural Experiment Station, preparations containing lemon eucalyptus oil are about as effective as those containing low concentrations of DEET. The website Picaridin.info states that a repellent with 30 percent lemon eucalyptus oil will provide approximately the same level of protection as a 10 to 15 percent preparation of DEET, calling it the most effective herbal repellent available. The Tick Management Handbook from the Connecticut Agricultural Experiment Station states that the Environmental Protection Agency recognizes lemon eucalyptus oil as safe for both adults and children, with a low level of toxicity. However, the Centers for Disease Control and Prevention recommends not using the product on children under the age of 3. On children 3 years or older, apply commercial preparations of 10 to 40 percent lemon eucalyptus oil directly to exposed skin. Also apply the oil preparation to exposed clothing. Because repellents with lemon eucalyptus oil will irritate the eyes, the Environmental Protection Agency advises not to apply lemon eucalyptus oil repellents around the eyes or on the face or hands of small children.